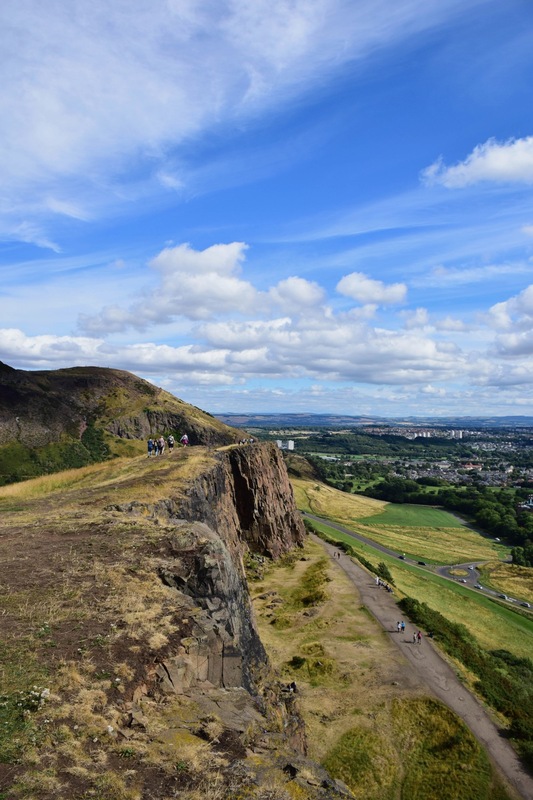 On our first day in Edinburgh, Joe and Kyrah had devised a walking tour they hoped was equally as punishing as the one we’d marched them around in Boston a few years ago. Starting our day at a lovely, simple cafe with a beautifully minimalist interior and excellently cooked eggs, we were fueled up and ready for our trek. The first stop of which was the National Museum of Scotland, Edinburgh — itself an activity that would’ve taken days to properly exhaust. In the brief period of time we stopped in (for free, go Europe) I was barely able to get past the incredible main atrium. And there were barely any exhibits in there. There was the skeleton of an extinct giant deer though, a European equivalent of a moose, but with more wicked antlers. It was placed in a setting suitably grand for what had been such an impressive animal. 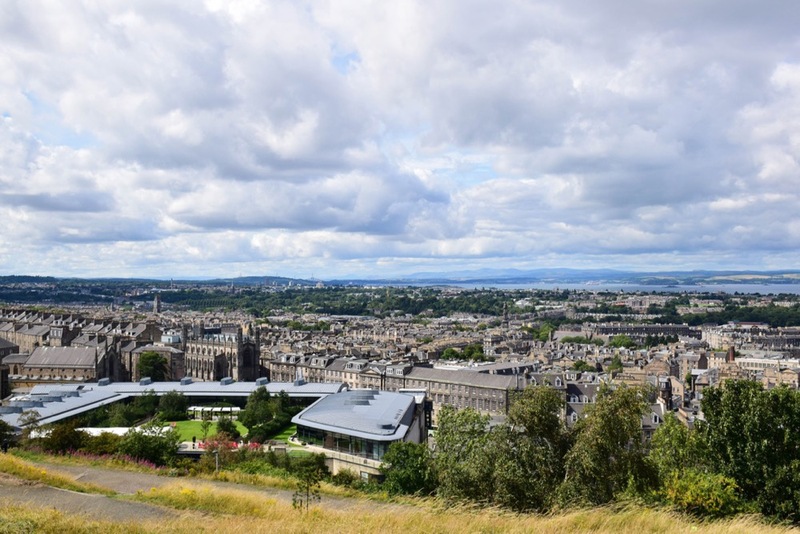 We wandered around at a pace that would become familiarly quick over the next few days as we attempted to pack as much of Edinburgh into our eyes in the time we had there. I took a little longer to go around the room that Kyrah said was her favorite, filled with British engineering marvels. In addition to the jaw dropping display of old small planes, there were Formula 1 racing cars, a timeline of bikes from penny farthing to motorcycle, and stunning scientific advances in personal mobility technology from wheelchairs to cutting edge robo-suit prototypes for disabled people. Continuing on from the museum deeper into the heart of town, we passed the famous Greyfriars Bobby and his shiny nose, rubbed by a million locals and tourists for luck, into Greyfriars Kirkyard, an especially aesthetically pleasing graveyard. I was more impressed with the layered buildings making up the skyline though. I just love how moody everything in Edinburgh looks, steeped in history even on the sunniest and most lighthearted summer’s day. The Harry Potter comparisons draw themselves, and boy does Edinburgh capitalize on it. JK Rowling supposedly wrote portions of the first book in the city, and there were numerous Harry Potter tours, merch shops, and themed cafes around town we bumped into. Even Heathrow had a whole Disney-style Harry Potter store in Terminal 5. I suppose when an inexhaustible fiction is one of your nation’s biggest cultural exports, you lean into it pretty heavily. Continuing our walk, we ended up at the first of the day’s markets, Grassmarket. 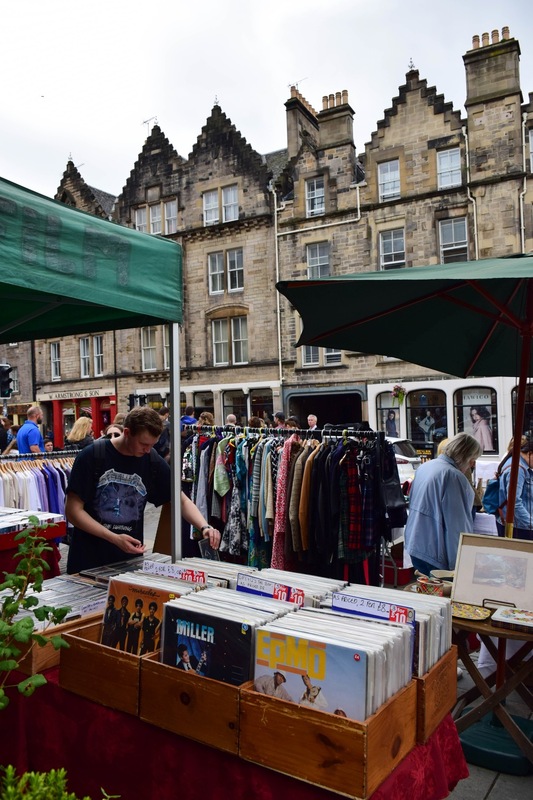 It had its namesake market going on, as it has for hundreds of years, now featuring vintage clothing, records, and food. It was also where we began to fully experience the Edinburgh Festival performers in full anger, physically spamming you with flyers advertising their shows and haranguing you to be interested in their amateur uni comedy or drama production. We’d inadvertently come for the festival, which spans the month of October and causes the city’s population to triple for the length of it. Suffice to say, Edinburgh was a lot busier than I remembered it, as I’d last come in the winter. It was also a lot more obnoxious and noisy, as you couldn’t walk more than 10 feet in a main part of town without someone advertising some play at you. Not to get ahead of myself, but we’d made plans to only see the one show so we could experience more of the city than the inside of dark rooms listening to people who like the sound of their own voice a little too much. Thankfully, the comedian we’d picked, a Mock the Week alum from New Zealand, Rose Matafeo, was excellent. Somehow she managed to have material about topics Lia and I had just been discussing during the past few months, so we were pretty tickled throughout. Back at the ranch, we’d battled from one market to another Saturday special, but this one was all food. After surveying the options, I decided another sausage was what I needed (after arriving at 11pm the night before I’d eaten 2 battered sausages from the chippy across the road) because I couldn’t get enough of British bangers, so joined Kyrah and Joe in getting some sausage rolls. They were fun, and we picked a mixture of ones containing haggis, black pudding, chorizo, and regular pork meat. Then we sat and waited for Lia to grab her less meaty dish in a car park under the castle. Pretty sweet spot, and the bunting added a lot. Bringing bunting back with me to the USA. Our walk took us around more streets, into a cute coffee shop called Lovecrumbs, where we refueled with cake and warm beverages, and I waited outside the bathroom for what I assume was a woman giving birth, she was in there so long. Eventually she came out with a toothbrush, which was anticlimactic. Winding our way back to Grassmarket, we tackled Victoria Street, known for its multicolored buildings and indie shops. It was also where we encountered the first of our Harry Potter tours we’d come across. From Victoria Street, we headed down the Royal Mile, checking out St Giles’ Cathedral after running the gamut of festival performers and flyer hawkers single handedly destroying the rainforests, before crossing the North Bridge overlooking the Waverley train station, heading for Calton Hill. I had fond memories of Joe and I climbing Calton Hill a few years back, when it was much quieter. The iconic view of the city was as I remembered it though, as was the one from the other side where you could see the Hibernian football stadium, the ground we’d be watching a game at the next day. The acropolis on top was still unfinished too. On the walk down we were able to see Arthur’s Seat, the most famous vantage point in the city. I’d climbed the hill last time I’d been in town, and despite the memorable wind had been a bit underwhelmed. So this time we headed for the Crags. 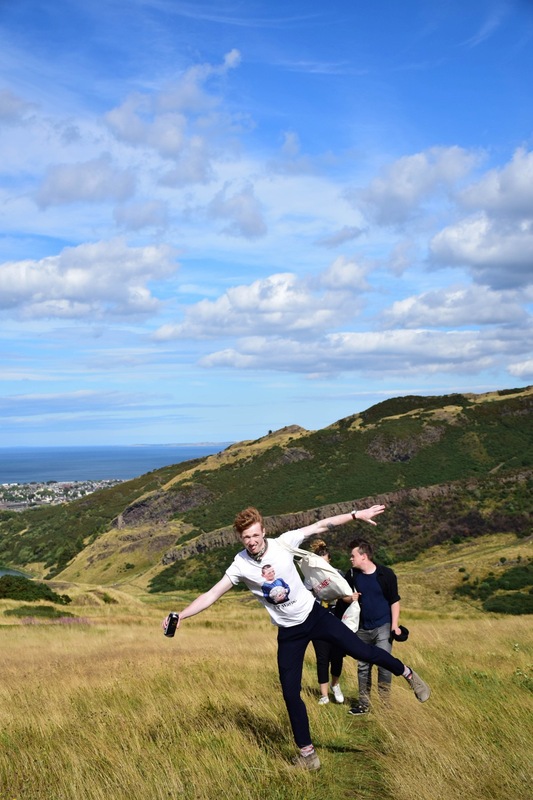 Along the way we popped into a shop to grab a few cans of beer and cider to enjoy in Holyrood Park at the base of the hills, to truly make the most of being on holiday and not being tethered to a car’s steering wheel. Multiple times throughout the day I’d stopped and appreciated just how nice it was to no longer be responsible for Suzy’s safety, or spending hours navigating narrow roads in her. Couple of cans consumed we began our yomp up to the cliffs’ edge. Simply put, the walk up these hills made me fall in love with Scotland. I’ve long wanted to do an extended trip to get lost in the highlands, having seen how pretty it looks in photos, but for now, this ruggedly immaculate and golden landscape would have to do. All the grass waved in the wind like shaggy hair, and the textures and pops of color from the various vegetation growing on the hillsides were all so cozy. Battling the elements and the incline both proved worth it once we got to the top though. Successfully tired out from our walk, sun exposure, and day drinking, we headed back to the house to rally before dinner and a long night of festival festivities.